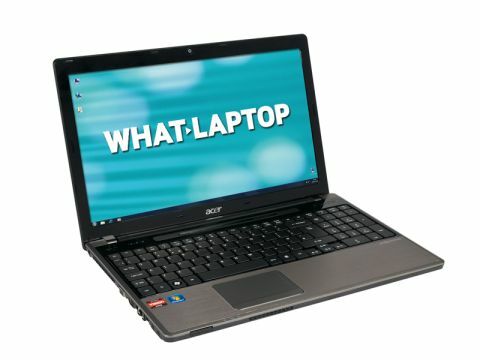 Acer has been extremely prolific of late, releasing a large number of laptops in its consumer Aspire range. The Acer Aspire 5553G is the latest and has a lot going for it, as it is one of the most affordable quad-core laptops you can buy. Initial performance test results weren't too encouraging, so supplementary benchmarks were run with very impressive results. A quad-core AMD Phenom II X4 N9320 processor runs the show with ample power and is backed by an impressive 4096MB of DDR3 memory and a 64-bit version of Windows 7. The 15.6-inch widescreen display has a 1366 x 768 pixel resolution and is perfect for watching movies or working on documents side by side and, while it's not the sharpest or brightest we've seen at this price point, it's adequate for working on for long periods of time. A glossy Super-TFT coating has been used for extra vibrancy, but the increased reflectivity makes for uncomfortable outdoor viewing. The 35mm chassis is surprisingly portable with a weight of just 2.5kg. It's also reassuringly durable with a brushed aluminium finish on the sturdy palmrests and an attractive lined pattern across the glossy lid. The 193-minute battery life is average for laptops this size and means you'll need to carry the charger with you on long journeys. The flat keyboard stretches the width of the chassis and is slightly raised for comfortable typing. All of the keys are a good size and perfect for touch typing, although not everyone will like the lack of definition. There's still plenty of space for a wide touchpad, complete with a scrollbar at the right edge for navigating documents or zooming in and out of photos. We found the dedicated ATi Mobility Radeon HD 5470 graphics card provided reasonable 3D performance, enough to play some older games and run multimedia applications, such as video editing software. A PowerSmart button is available for switching between the ATi card and a basic integrated GPU. This is useful for preserving battery life when working on simple office applications, which have no need for high-quality 3D rendering. Features are standard, with a 320GB hard drive providing enough room for hundreds of albums and films, with space to spare for your essential applications. Four USB ports are available which is one more than usual, although three of them are bunched together, so a single bulky peripheral could cover the others. The Acer Aspire 5553G is a decent desktop replacement machine, offering impressive performance for such a low price. While there's nothing revolutionary, this is a well-built machine ideal for the demands of most families.